Asian Books Blog is based in Singapore. Our regular column Lion City Lit explores in-depth what’s going on in the City-State, lit-wise. Here Lucía Damacela continues her occasional series highlighting Singapore online literary magazines, by talking to New York-based Kimberley Lim and Singapore-based Hao Guang, respectively the founding editor and the co-editor of OF ZOOS, an annual, theme-based, online magazine publishing poetry and poetically sensible art by Singaporeans for Singaporeans, and for everyone else. It published its first issue in April 2012. What were the beginnings of OF ZOOS? Kim: I was majoring in English with a concentration in Poetry Writing at the University of Virginia, where I had volunteered for a campus-based literary journal. I was amazed by how easy it seemed to be. Why couldn't I use my local platform to do it for Singaporeans - and everyone else, as is our motto? 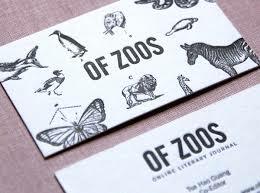 How does OF ZOOS fit into the Singapore literary landscape? Kim: So often, writers have a ready-made poetry portfolio that they repackage and ship out to multiple magazines in hopes of publication. Nothing is wrong with that. But I wanted to do things differently; challenge writers to create work in line with a theme for every issue; to come up with something new. OF Zoos also wants to encourage people who don't typically see themselves as poets - whether long-form writers, visual artists, musicians, cinematographers, or even people who love poetry but have never written it - to see themselves as poets. One of the missions of OF ZOOS is to simply provide a platform for experimental voices. Could you comment on recent changes to the literary landscape in Singapore? HG: Since 2012 it's really become a more complex and uncategorisable place - which is very good. There are more writers, books, and avenues for publication. Math Paper Press has grown into a major player, Epigram has opened a London office, and a rash of newer online journals has started to spread. There are literary groups and organisations working to build up other parts of the literary ecosystem. The Select Centre holds a translation festival and a translator's lab. Singapore Unbound is based in the US and encourages dialogue between writers from there and here through a festival, a fellowship, and a soon-to-come press. The Poetry Festival is returning Singapore literary culture back to a part of its history by actively placing work in different languages on the same platforms. Sing Lit Station, another non-profit I'm helping out at, runs numerous projects designed to connect readers with writers, and build up writers. Book-a-Writer is our new workshop directory catered to schools. Manuscript Bootcamp is an incubator for future writers. poetry.sg is a poetic history portal. SingPoOnTheSidewalks and Sing Lit Body Slam bring poetry to our pavements and neighbourhoods. Then there's the Facebook-driven Singapore Poetry Writing Month, on now, where 4000+ people tune in to daily writing prompts. It's a wild, wild world, and we couldn't be happier to play a small but hopefully meaningful part in it. What types of work do you publish? Kim: We want to celebrate ideas, difference, experiments, and poets who dare. We want contributors and readers to be challenged into new (and weird) ways of thinking. Cross-pollination and diversity is also very important to us, and we like poets to work with each other, across boundaries, to come up with new monsters. Of course, we also welcome traditional forms, which make up a huge part of past issues. We are extremely excited about our next issue, Faithless Translations. We are currently accepting submission for this. What about the current issue? HG: It’s on Englishes jargon and translations. I'd like to draw your attention to Abdul Hamid's work. He is one of a very few writers committed to investigating the uses of Singlish beyond verisimilitude or comedy. It's the kind of work that changes the idea of what is possible in local poetry in a significant way. What are the challenges and opportunities for literary zines/journals in Singapore? Kim: Challenges: we don't have many published literary zines that work on subscription basis, i.e. we aren't monetised. So, we have to be volunteer-run, because it's hard to get people to pay to read poetry. Opportunities: The scene is burgeoning, there are so many zines around, and you can just up and start your own, if you have the passion. I didn't have the resources and I didn't have the know-how, but I did have an idea. HG: Kim's challenge is my opportunity. I love working as lean as possible because it forces us to think of innovative new things for cheap. We have no stakeholders besides ourselves, our writers, and our readers, so we can be super flexible - versus if we had, say, customers, or government grant money. Of course, it would be nice to have money, but honestly, I don't know what we would put it into. Hosting? Paying contributors? It wouldn't make sense to profit from this. But yes, one thing we do lack in the zine/journal scene is money in general. Sing Lit Station may be trying to remedy that, I hear. I think there may be too many journals for the number of people reading and writing here - the question we all have to struggle with is: what new thing does your journal add to the full plate? For OF ZOOS it's pretty simple: process-driven themes, and a sense of playfulness. My first connection with the magazine was as a contributor, and those things are what drew me to submit in the first place. And later, I hopped on board Kim's crazy train as an editor, and here we are!